Two recent publications, Gnerer et al. and Diao et al., address the issue of recreating the fine transcriptional patterns of endogenous genes with binary expression systems in insects. Binary expression systems are extremely powerful tools for controlled gene manipulation. The major limitation of these systems is the lack of available promoters and enhancers that can recapitulate native gene expression. Evolution has provided a genetic orchestra and now scientists can change the instruments at will. The spatial and temporal expression of genes has been refined through the evolution of regulatory elements. Cloning of regulatory elements and fusing them with reporter genes does not always result in gene expression with the expected patterns. Genomic context and architecture play an important role in gene expression; characteristics that can be exploited in gene and protein trap technologies. Converting MiMICs by recombination-mediated cassette exchange. from Gnerer et al. Gnerer et al. report generating a variety of binary expression systems through the conversion of intronic MiMICs (Minos-Mediated integration Cassettes integrated into introns) into either intronic gene-traps or protein-traps by recombinase-mediated cassette exchanges with expression patterns that precisely reflect the endogenous gene expression pattern. Thousands of Drosophilai lines containint MiMICs are available (see Venken et al 2011 and Nagarkar-Jasiwal et al 2015). What makes this cassette unique is being flanked by inverted attP sites, allowing for site-specific cassette exchange. Of the popular transposon-mediated integration system, the Minos system shows patterns of integration that are random with little bias of insertion site preference allowing for a greater percentage of the genome to be represented through insertion sites. In brief, the author’s gene or protein traps required swapping out the MiMIC for an engineered cassette using phiC31 recombination. Gene-trapping relies on a cassette containing a splice acceptor followed by Gal4 to be introduced into the 5’ non-coding intron of a gene of interest. Similarly, protein-trapping inserts into a 5’ coding intron and requires a splice acceptor and a self-cleaving peptide unit prior to the binary regulatory element (Gal4 in this case). This generates a fusion protein; part native gene product and part binary element that will subsequently be self cleaved after translation into a non-functioning native gene product and a functional binary factor. The authors speculate that this method of conversion will expand number of intragenic MiMICs available for use in binary regulatory systems. In addition to the Gal4/UAS system, the authors also generated lines that also use the LexA/LexAop, GeneSwitch, and Gal80 systems. “plug-and-play” cassettes or “Trojan exons”. From Diao et al. Alternative to the MiMIC-mediated gene or protein trap, Diao et al. reports the use of a “Trojan exon” that originates from an insertion of a Trojan-Gal4 expression module by CRISPR/Cas9 integrations. This method does not rely on the randomness of transposon-mediated integration but rather allows the user to select the site of integration; allowing for greater customization of expression. This cassette contains a splice acceptor followed by a self-cleaving peptide fused to Gal4. The authors again take advantage of the flanking phiC31 sites to perform exon swapping that generates myriad of expression possibilities when combined with various binary systems. 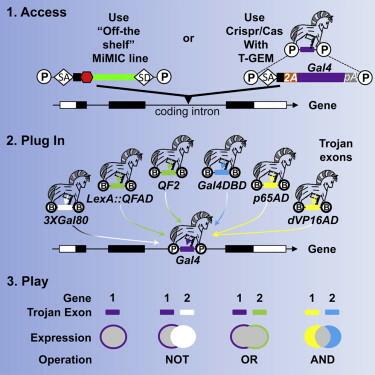 Whether generated by a MiMIC or Trojan exon both technologies “hijack” a gene’s native expression pattern. Having the ability to customize expression patterns expands the capabilities and range of application for binary systems; making these technologies a true “plug-and-play” utility. Diao F, Ironfield H, Luan H, Diao F, Shropshire WC, Ewer J, Marr E, Potter CJ, Landgraf M, White BH. Plug-and-Play Genetic Access to Drosophila Cell Types using Exchangeable Exon Cassettes. Cell Rep. 2015 Mar 3;10(8):1410-21. doi: 10.1016/j.celrep.2015.01.059. Epub 2015 Feb 26.